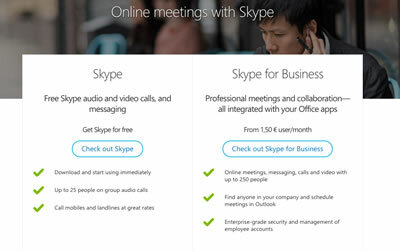 Key Difference: Skype, Skype Meetings, and Skype for Business are three different versions of Skype available for use. Skype is designed primarily for use by regular consumers to make Skype to Skype calls. Skype Meetings is used to broadcast meetings. 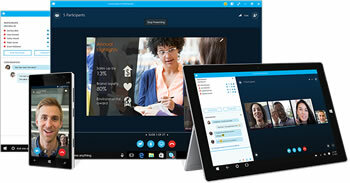 Skype for Business is designed for large businesses and comes integrated with Microsoft Office. Skype is a popular communication application that allows people to communication. The most common feature of this app is instant messaging that allows people to communicate by sending text and video messages, as well as other text, images, emojis, videos, etc. What set Skype apart at the time of its release was the fact that it allowed its users to make free Skype to Skype calls. Additionally, users were also able to purchase credits in order to make cheap calls to landlines and mobile phones. Skype for Business developed out of what was originally Microsoft Office Communicator and Microsoft Lync. After Microsoft purchased Skype in 2011, it started to develop its Communication Suite in the image of Skype, eventually, renaming and launching it as Skype for Business. Skype also replaced Windows Messenger. Another service that was launched was Skype Meetings. Both of these services were aimed at the businesses while the original Skype targeted the consumer market. Today, Skype, Skype Meetings, and Skype for Business are three different versions of Skype available for use for its audiences. The primary different between the different services is the fact that Skype is primarily targeted towards general consumers, whereas Skype Meetings, and Skype for Business are targeted towards businesses. Due to this, the three also differ in the types of services they provide. The regular Skype allows one to message with others, as well as make calls and video calls to people around the world who also have the application downloaded. Additionally, it also has the option to make calls to the landlines and mobile phones of people who do not have the app or if they do not have access to internet. Skype for Business is even more professional and is designed for larger corporations. It allows for the addition of up to 250 people to online meetings. It also provides enterprise-grade security, and allows for the management of employee accounts, and can be integrated into Office appss for better functionality. Also, while Skype is free to download and use, the other two are not. Their costs may vary depending on the region, as well as the size of the team, as Skype for Business typically charges per month per employee basis. To connect with and collaborate with up to 10 people at once in online meetings.